We have recently received an update from Dr Kim Stevens as follows. An online questionnaire has been developed in SurveyMonkey. Best method for deployment of the questionnaire to be discussed at a meeting in early April (to be attended by members of RVC and Anderson Moores Veterinary Specialists). 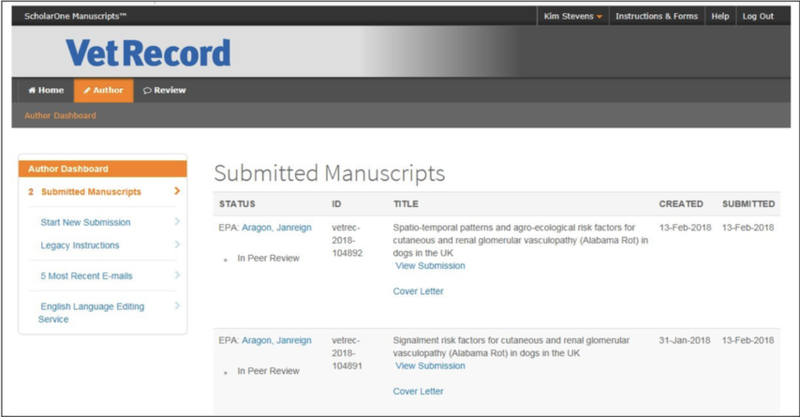 ​​A scientific manuscript titled Signalment risk factors for cutaneous and renal glomerular vasculopathy (Alabama Rot) in dogs in the UK has been submitted to The Veterinary Record and is currently under peer-review. Upon completion of the review process, KIMENE ANALYTICS undertakes to respond promptly to any issues raised by the reviewers, amend the manuscript where necessary and resubmit to The Veterinary Record for publication. A lay summary of the main results of the manuscript has been prepared and will be released to ARRF for deployment upon their website or similar, upon publication of the manuscript in The Veterinary Record. The results of Tasks 3 and 4 have been combined into a single scientific manuscript titled Spatio-temporal patterns and agro-ecological risk factors for cutaneous and renal glomerular vasculopathy (Alabama Rot) in dogs in the UK. The manuscript has been submitted to The Veterinary Record and is currently under peer-review. Upon completion of the review process, KIMENE ANALYTICS undertakes to respond promptly to any issues raised by the reviewers, amend the manuscript where necessary and resubmit to The Veterinary Record for publication. The first part of the epidemiology work is nearing completion and will be submitted to a scientific journal by the end of January. Hopefully the results will be available in the public domain in March or April.